Bed bugs are common pests found throughout the world. These small, oval-shaped insects may not seem very threatening, but they can be quite problematic for some homeowners, as they thrive by sucking the blood of animals and humans, causing rashes, swelling, itching, and many restless nights in bed. An infestation of these bugs can wreak havoc on a person and be difficult to remove. In fact, many people suffer from anxiety and PTSD-like symptoms as a result of a bedbug infestation. Sleepovers are a common event for social children, but when your child sleeps in an environment that you have no control over, there’s always a risk that they could bring bed bugs home with them. Here, we’ll look at how you can reduce the threat of your kids becoming a late-night snack for a bug and, potentially, bringing it home with him or her. Bed bugs can spread from one home to another by hitching a ride on luggage, clothing, and other materials. Bedbugs can even appear in shoes, and blankets that your child has taken with him to his friend’s home. Bedbugs live for a long time (for a bug, anyway) and can go weeks without feeding, so they can survive a journey. Before you begin to fret, though, know this: bed bugs don’t spread as easily as you may assume, and your child would have to bring a lot of bugs home for you to suffer from your own infestation. In other words, it’s a good idea to keep calm. Don’t cancel social events just because you’re worried about these pests. If you’re feeling concerned, you can use the following tips to help put your mind at ease. Depending on your child’s age, you could always consider talking to them about what bed bugs might look like, and how they can avoid them. 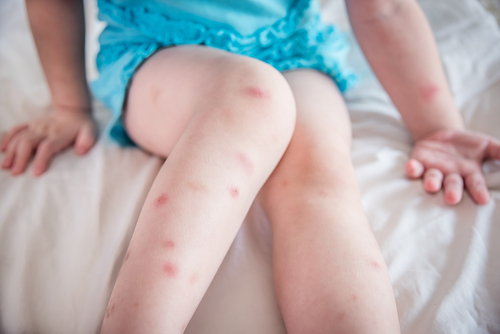 You can tell your child to inform you if they spot any signs of bed bugs at a friend’s home, and remind them that it’s important to keep the infestation out of your own home. Some parents might consider talking to other parents about whether they’ve ever had bed bugs in the past. If you know that someone is struggling with a bedbug problem, make sure that your child doesn’t sleep over at their house, or vice versa, until you know it’s safe. If you know your child attends a lot of sleepovers, then it might be worth investing in some gear that could help them to avoid bed bugs. For instance, you could buy them a zip-up sleeping bag that prevents them from encountering too many potentially infested surfaces. You can also give them a small washable pillow to take with them. When your child wakes up in the morning, tell them to put their sleeping bag straight into the storage sack. Encourage your children not to share or borrow any clothing from his or her friends. If your child comes home with something unfamiliar, put it in the washing machine on a hot-wash cycle. You might consider giving your child his or her own laundry bag to store his clothing in after a night at a friend’s house. They can throw all their clothes directly into this bag, so that you can immediately wash any items when they come home. According to some studies, bed bugs have favorite colors. Scientists initiated lab tests with bed bugs and discovered that they often looked for shelters in black or red spaces, while actively avoiding shades of green and yellow. While changing all your décor and bedding might be going a step too far, you could consider choosing specific sleeping bag and pajama colors if it puts your mind at ease. If after a sleepover you do recognize the signs of bed bugs, then you need to know what to do next. The best way to prevent the infestation from getting out of hand is to speak to a pest removal specialist as quickly as possible. You need to get the bugs gone, and gone fully. Bedbugs are surprisingly versatile, so eliminating them is not a simple, do-it-yourself task. Reach out to the professionals at Adios Pest Control as soon as you notice the first signs of bed bugs.